Ultrasonography, or ultrasound, is a diagnostic imaging technique similar to radiography and is usually used in conjunction with radiography and other diagnostic measures. It allows visualization of the deep structures of the body. Ultrasound can be used for a variety of purposes including examination of the animal’s heart, kidneys, liver, bladder, and etc. It can also be used to determine pregnancy. Ultrasound can detect fluids, cyst, tumors, or abscesses. 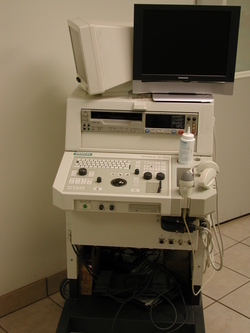 A “transducer” is applied to the surface of the body to which an ultrasound image is desired. Gel is used to help the transducer slide over the skin surface and create a more accurate visual image. Then sound waves are emitted from the transducer producing a picture.